Ernesto Valverde during the match against Manchester United. Barcelona saw off Manchester United to reach the Champions League‘s semi-finals as they overcame their quarter-final curse, much to Ernesto Valverde‘s delight. Lionel Messi scored twice as he ended his own quarter-final drought, and Valverde was understandably pleased with his Argentine. “Messi always appears,” Valverde said of his No.10. “Not only in moments, but in the games as a whole. Philippe Coutinho scored for the Catalans on the night, then celebrated by putting his fingers in his ears in what appeared to be a message to those who have criticised him. “I don’t know, I haven’t seen it,” Valverde responded when asked about the gesture. “I don’t know what it means, so he’ll have to explain it. 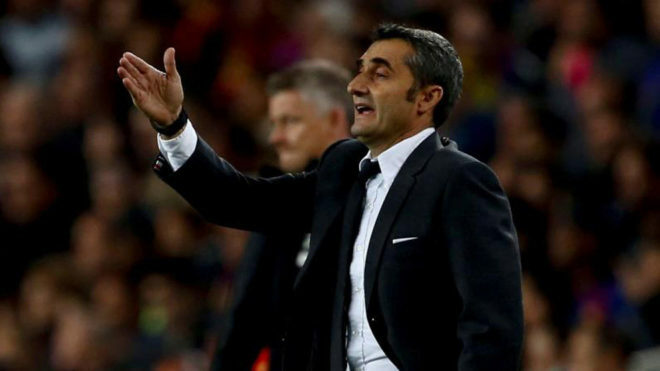 Barcelona impressed at the Camp Nou, and Valverde echoed Messi‘s comments as he expressed his happiness with the performance. “It’s our way of playing,” he explained. “Sometimes it’s better and others it’s not as good.